When traveling in London, it’s always nice to find cool spots for outdoor breakfast on sunny days. Shoreditch is a great place for that! 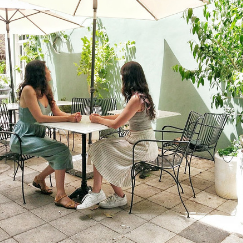 we found Dishoom, which is a hip Indian restaurant, with a cool outdoor sitting, that serves breakfast, lunch and dinner. Opening hours: Monday -Wednesday: 8:00-23:00, Thursday-Friday: 8:00-00:00, Saturday: 9:00-00:00, Sunday: 9:00-23:00.